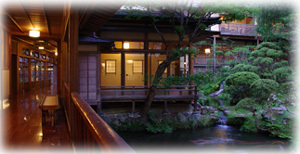 Aizu Ryokan Higahsiyama Onsen Mukaitaki | Guest Rooms | The architecture is genuine Sukiya style. From this space, you can feel relaxing of extraordinary experiences. Please be assured. Rooms - way Taki is not just old. Free Internet connection warm water washing toilet, wireless LAN, such as temperature setting possible air conditioning system, in the taste of ancient, you can spend a comfortable time. We are proud to keep Japanese tradition and culture alive. In 1996, the Japanese government officially recognized Mukaitaki's architecture and construction, as well as national historic and cultural significance.